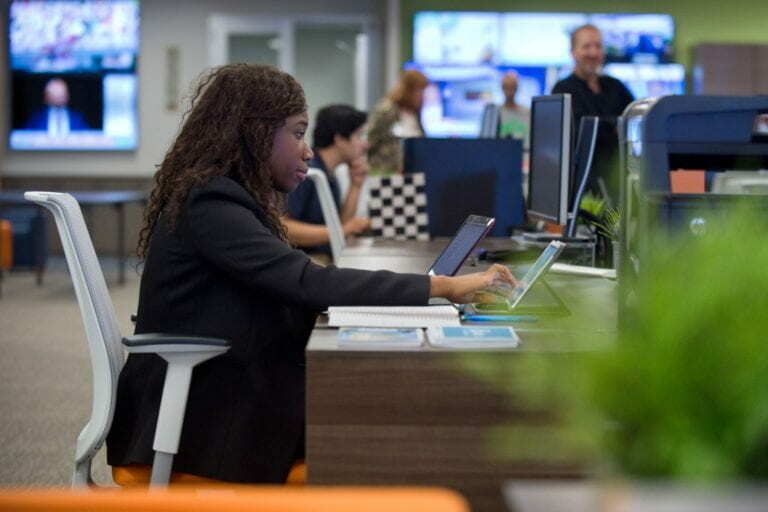 One walk through The Cove – the physical home of Applied Innovation – quickly alerts visitors that the University of California, Irvine means business. Located in University Research Park, the 31,000-square-foot facility is the hub of UCI’s efforts to collaborate with the larger economy. The bustle of energy there is electric – from the 100-foot video wall surrounding a beach-themed conference room to the dozens of offices buzzing with startup company teams striving to transform their dreams into functional enterprises that will benefit society with new solutions to old problems. The Cove is the embodiment of what the Applied Innovation is all about. Founded in 2014 and led by UCI alumnus Richard Sudek, Applied Innovation (formerly the Institute for Innovation) serves, in his words, as “the front door” for all in­dustry collaboration with UCI, a one-stop shop for outside entrepreneurs seeking access to university inventions and talent, large corporations looking to tap the school’s research and development capabilities, and investors who want to put their cash into promising new companies. 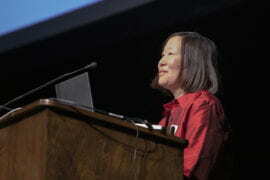 At the same time, Applied Innovation offers concierge-level services to student inventors and faculty entrepreneurs, helping them take their ideas from concept to profitable product, smoothing the way to success with an array of facilities, along with 250 mentors who can provide guidance for every­thing from acquiring patents to early funding, marketing strategies and licensing their technology. In July, Applied Innovation moved into its new, custom-designed home. 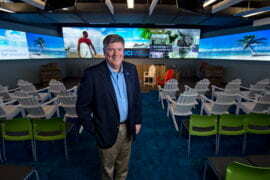 “Our facility is called The Cove to indicate that it’s a safe harbor for entrepreneurs,” says Sudek, who founded and sold a successful computer company and led Orange County’s famed Tech Coast Angels before becoming executive director at Applied Innovation. “We’re creating a microcosm of Orange County’s entrepreneurial ecosystem under one roof with incubators and accelerators, angel investors and venture capitalists, mentors and legal experts – all the resources and expertise new businesses need to succeed,” he says. It’s a measure of Applied Innovation’s appeal that every cubic inch of The Cove was spoken for before the doors opened. Sudek says a 15,000-square-foot expansion is already being planned. Michelle Khine, associate professor of biomedical engineering at UCI, has moved her latest startup into The Cove. TinyKicks has developed a device that makes it easy to keep continuous track of fetal activity to protect the health of unborn babies and expectant mothers. The company will tap into the $9 billion global market for fetal monitoring with an affordable $200 product. 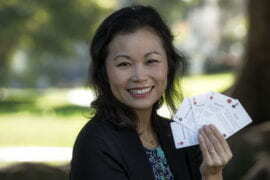 “Applied Innovation will be a tremendous resource to professors, researchers and students,” says Khine, who became a star in the scientific world in 2005 when she figured out a way to use a child’s toy and her toaster oven to make sophisticated microfluidics prototypes that launched a whole new type of technology. “I am positive they will help us grow,” says Per Larsen, a postdoctoral researcher at the Donald Bren School of Information & Computer Sciences, who just relocated his fledgling computer security company, Immunant, to The Cove. Immunant protects frequently attacked applications such as Web browsers and servers by automatically altering code without affecting function, making them moving targets for hackers – but not all The Cove’s startups are purely high-tech. “We have extremes of phenomenal science being transitioned [to socially beneficial applications] and cool consumer-oriented products,” says Carolyn Stephens, who oversees operations and marketing at Applied Innovation. 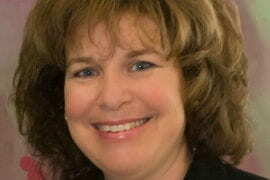 Gina and Jenae Heitkamp’s fun, Web-based startup, iBesties, falls somewhere in between. Nothing is more essential to startup success than understanding and having access to money, and Applied Innovation is uniquely positioned to infuse entrepreneurs with financial support. Monetary support for new businesses typically ramps up from seed funding to angel investments to venture capital to backing by banks and other traditional sources of business loans and investments, and Applied Innovation has the complete spectrum in place. “If there’s an entity on campus that needs to get backing, here or at another institute or school, we have developed a full continuum from fast funding to Tier 1,” says Sudek, an active angel investor who has evaluated more than 1,000 companies for financial support. The continuum includes a $5 million seed fund Applied Innovation is creating, active participation from the county’s most astute angel investors (Tech Coast Angels has an office at The Cove), a consortium of 13 venture capital firms Sudek has organized, and major banks. “My bankers are ready to mentor startups and help them become bankable, and we’re ready to back them when they do,” says Stephen Gordon, chairman and CEO of Opus Bank, which he started in 2010 and has become the fastest-growing bank in the western United States – with $6 billion in assets – by investing in innovation. “We’ve been waiting a long time for something like this, so there’s definitely a buzz in the air,” Khine says. “There’s a lot of excitement,” Sudek concurs. 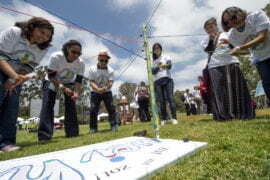 With strong funding resources, the chancellor’s support, Sudek’s leadership and the expertise of 250 on-call mentors – including many local business luminaries – Applied Innovation may well fulfill its goal of making Orange County a globally recognized center of innovation and entrepreneurship that rivals Silicon Valley. “Richard Sudek is an outstanding and passionate leader who has devoted his career to empowering entrepreneurs. 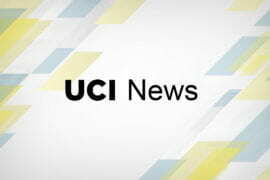 In less than one year, he has created a dynamic organization that not only is serving our university community but has enthusiastic participation from entrepreneurs and investors in the broader region,” says UCI Chancellor Howard Gillman. “Applied Innovation has tremendous potential,” Gordon says.